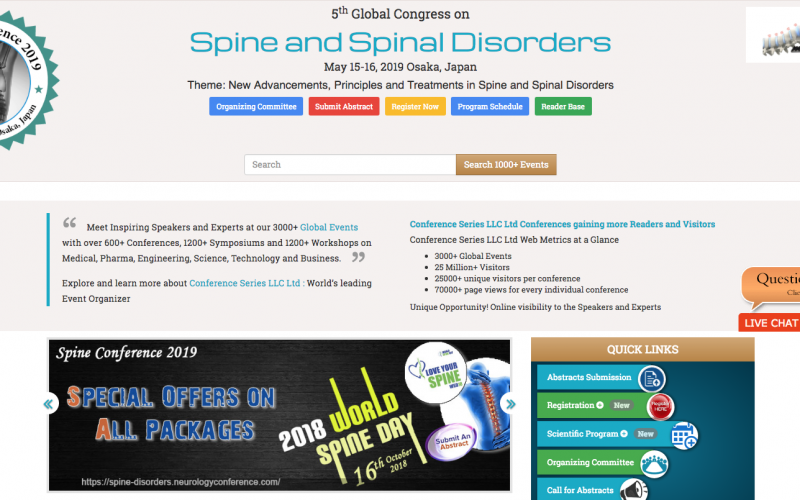 Conference Series LLC LTD invites all the participants across the globe to attend the “5th Global Congress on Spine and Spinal Disorders” (SPINE CONFERENCE 2019) conveys recent discoveries and developments in Spine surgery techniques and new methods of treatment. A complete knowledge of a scientific discipline that described and explores the use of Spinal Implants and Devices in the industry as well as healthcare markets. Conference Series organises a conference series of 3000+ Global Events inclusive of 600+ Conferences every year across the USA, Europe & Asia with support from 1000 more scientific societies and publishes 700+ Open access journals which contain over 70000 eminent personalities, reputed scientists as editorial board members.